PXI has long been established as the de facto standard for building automated test systems, but its uses stretch beyond solely manufacturing or production test. 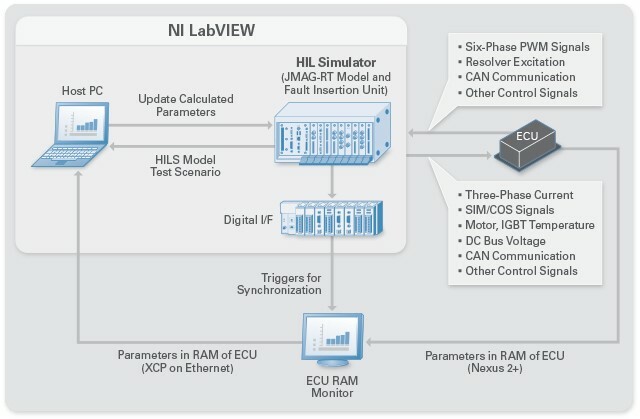 With the PXI platform’s capability for running real-time operating systems or deploying code to FPGAs, it is also well suited to use earlier in the development process, particularly for complex devices like electronic control units (ECUs) and full authority digital electronics control (FADEC) systems. Today, automobiles are equipped with an enormous number of ECUs to manage expanded functionality and advanced controls in the vehicle. In a hybrid vehicle, the motor ECU plays an even more complicated role as it manages the interaction between the conventional engine and the electric motor, along with its power systems. Fuji Heavy Industries, parent company of Subaru, set out to develop its first hybrid vehicle—the Subaru XV Crosstrek Hybrid. This was their preliminary attempt to deliver a production model hybrid vehicle targeting both domestic Japanese and North American markets. To achieve these goals, the engineering team used a V-diagram approach to launch the design and verification process. The diagram describes a phased methodology for embedded software design and deployment validation, including test points at each stage. In multiple stages of the design process, the team needed the hardware-in-the-loop(HIL) system to verify the motor ECU against a real-time motor simulation that accurately represented the actual vehicle motor. Additionally, using the HIL system, they could meet traceability requirements by recording test results automatically and automating regression tests when an ECU change was made. The new verification system consists of a real motor ECU and the PXI-based HIL system that simulates motor operations. The HIL system can represent any operating condition of the motor by setting physical parameters such as inductances or resistances. It can also set parameters of the power electronics, including fault conditions or test scenarios such as combinations of load torque and desired rotating speed. By simply changing a parameter in the middle of the test, the HIL system can easily simulate complex test scenarios. This could include the previously mentioned loss of traction or even a power electronics fault in the inverter that would destroy physical hardware. When the operator requests a test pattern, the HIL system responds the way a real motor would, and the overall system response can then be cross-referenced with expectations to validate that the controller safely handles the test case. In the HIL system, the simulation loop rate, equivalent of the temporal resolution in simulation, was a critical factor. For the motor ECU, the loop rate needed to be 1.2 µs or less for the simulator to work. One of the major benefits of a PXI-based, automated system is the amount of engineering time saved in performing the tests, as well as removing the risk of human error that can occur in manual testing. The software-defined approach with PXI offered significant advantages to FUJI when performing verification of ECUs for the Subaru XV Crosstrek Hybrid. From increasing throughput to reduce test times, to options for running in real-time or on FPGAs for higher performance and faster loop rates, PXI is well-suited to testing complex electronic devices throughout the design process.